Not to be confused with Yoshi's Cookie. Yoshi and Cookies is the first level of World 3 in Yoshi's Woolly World. Many elements of this level reference Yoshi's Cookie. Being cookie-themed, this level starts with a single Snoot, a single Shy Guy, and a few Monty Moles, with certain cookies behaving like Flip Panels and Yoshi Cookie walls falling down. As Yoshi advances further in the level, there are now cookies that must be hit with yarn balls to serve as temporary platforms for Yoshi to walk on. Following that is an area where Snoots shoot vertically. Afterwards, a Hook Guy appears, followed by some crumbling walls and the first checkpoint. After the checkpoint, there are more Flip Panel cookies, followed by more Shy Guys. Yoshi will then encounter a stack of three Snoots over a Monty Mole Patch. After some Hook Guys, the second checkpoint is reached. More crumbling Yoshi Cookie walls are encountered, as well as more Flip Panel cookies. At the final stretch, Yoshi must rush past and jump on each of the crumbling walls, with the last three forming a staircase to the goal roulette. Smiley Flower 1: At a Flip Panel cookie platform just above the second Snoot. To obtain it, Yoshi must throw a yarn ball at a cookie platform to the left, then jump to the right to access the platform. Smiley Flower 2: Immediately after the first Hook Guy, there is an outlined warp pipe that Yoshi can access. Inside, Yoshi must collect all beads triggered by the exclamation circle before time runs out to get the Smiley Flower. Smiley Flower 3: Inside the first Monty Mole Patch. Smiley Flower 4: Yoshi must enter a white warp pipe just after the first Monty Mole Patch. Inside, Yoshi must collect all beads triggered by the exclamation circle before time runs out to get the Smiley Flower. Smiley Flower 5: After a row of three crumbling Yoshi Cookie walls, there is a hidden Winged Cloud that Yoshi can activate to reveal a cannon, which he can then use to launch himself high up, then walk along the crumbling walls to reach the Smiley Flower. Wonder Wool 1: In between the second set of crumbling Yoshi Cookie walls; Yoshi must wait until they crumble, then go for the Wonder Wool. Wonder Wool 2: On top of some cloud platforms above the group of vertically-shooting Snoots. Yoshi must jump on the buttons they fire to get it. Wonder Wool 3: In a hidden Winged Cloud on a platform with the first Monty Mole after the first checkpoint. Wonder Wool 4: At the top of a cookie wall. 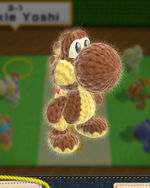 To get it, Yoshi must throw a yarn ball so that it ricochets off a checker of three platforms, then use the platforms to obtain the Wonder Wool. Wonder Wool 5: In a hidden Winged Cloud at a Flip Panel cookie with a crumbling Yoshi Cookie wall stacked on top of it. Collecting all of the Wonder Wools knits Cookie Yoshi back together. The first several notes of the song for this stage are taken from the main theme of Kirby's Epic Yarn and Kirby's Extra Epic Yarn, other games developed by Good-Feel, and were included as an easter egg by Tomoya Tomita, the composer for both games. ↑ Tomoya Tomita. (December 12, 2016). Remastered Yoshi's Woolly World - Yoshi and Cookies ヨッシーとクッキー. YouTube. Retrieved January 25, 2017. This page was last edited on February 14, 2019, at 14:24.